How Will Payroll In France Change In 2016? Increases in the minimum wage, pension contributions and changes in Agirc and Arrco supplementary pension fund contributions are just some of the changes that payroll departments must take into consideration in 2016. To assist you in meeting your filing and other obligations, we have provided an exhaustive list of these changes below. The hourly gross minimum wage was increased to €9.67 on 1 January, for a gross monthly minimum salary of €1,466.62. The “guaranteed minimum” reference value is still € 3.52. The annual, monthly and hourly French social security ceilings for 2016 are respectively €38,616, €3,218 € and €24. A decree issued on 29 December 2015 increases the employer’s health insurance contribution rate from 12.80% to 12.84%, as of 1 January 2016. It applies to all contributions and taxes that will be payable as of 1 January 2016. There is no change in the employee’s contribution. Pursuant to Schedule B of the 2016 Social Security Financing Act (Loi de financement de la sécurité sociale), this increase is intended to reduce the deficit of the basic health insurance fund by transferring contributions from the occupational accident and illness fund (the “AT-MP” fund) to the basic health insurance fund. This decree also modifies the calculation of the tax allowance on low salaries (formerly known as the “Fillon deduction”). Pursuant to the decrees of 2 July 2012 and 17 December 2014, capped and uncapped pension contributions will be raised 0.05 of a percentage point for employers and also for employees. 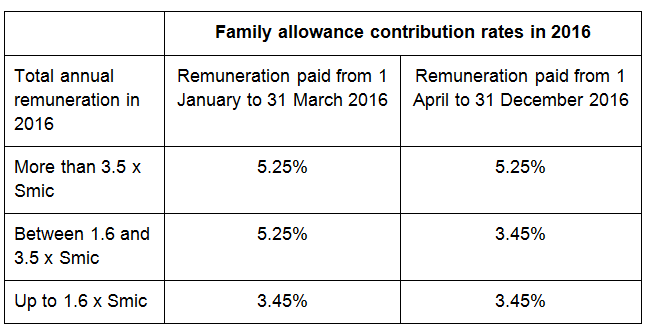 This increase will be repeated in 2017, but only for uncapped contributions, as shown in the table below. As of 1 January 2016, all salaried employees must have the opportunity to receive minimum health care coverage that is at least 50% funded by their employer. The employer’s insurance policy may provide for some exemptions to the mandatory insurance of employees. The employer may also grant “health cheques” to some employees employed under temporary contracts. More information about these “health cheques” may be found in the decree issued on 30 December 2015. When the salary of an executive (‘cadre‘) is less than or just above the social security ceiling, a contribution must be paid to Agirc to ensure that this employee will receive an annual minimum number of Agirc pension points. This is known as the “minimum points guarantee”. An Agirc-Arrco circular of 28 December 2015 sets forth the MPG requirements for 2016. The monthly contribution is €68.07, of which the employer’s and the employee’s shares are respectively €42.23 and €25.84. The monthly salary differential (B bracket minimum) is €331.24. Giving the increase in the social security ceiling, the “trigger salary” below which the MPG is required has also increased, to €3,549.24 (€3,218 + €331.24). The decrease in family allowance contributions on all salaries less than 3.5 times the minimum legal salary (the “Smic”), which was scheduled for 1 January, has been postponed to 1 April 2016, as of which date the family allowance contribution rates will be lowered from 5.25% to 3.45% on all salaries less than 3.5 times the Smic. The reduced rate will be applied to the total annual remuneration received in 2016. As of 1 January, only companies with at least 11 employees must pay the transport tax and the 8% supplemental health insurance tax. The mechanism for smoothing the threshold effects on the transport tax has been maintained. The increase in the training tax from 0.55% to 1% will only apply to companies with at least 11 employees, and not 10 as was previously the case. This measure will apply to training tax to be paid as of 2017, which is based on the remuneration paid in 2016. Companies that cross a workforce threshold in 2016, 2017 or 2018 in respect of the 8% supplementary health insurance tax (11 employees), the Fnal tax (20 employees) and the deduction on employer contributions on overtime hours (20 employees) will be exempted from this threshold effect for three years. For the highest severance payments, the so-called “golden parachutes”, the threshold at which social security contributions must be paid on the full amount of the payments has been reduced under the 2016 Budget Act from 10 “social security ceilings” (€380,400) in 2015, to five (€190,200). This applies to severance payments to directors and corporate officers (“dirigeants et mandataires sociaux”), as defined under Article 80 ter of the French tax code. The 2016 Budget Act also removes the obligation to pay contributions on the full amount of severance payments to employees that exceed 10 SS ceilings, pursuant to Article L. 242-1 paragraph 12 of the amended French Social Security Code. Starting in 2016, all severance payments that are not subject to income tax will be entitled to an exemption on social security contributions equivalent to two SS ceilings. There will be no change however to CSG/CRDS exemptions. If the severance payment exceeds 10 SS ceilings, CSG/CRDS taxes will still be required on the full amount, pursuant to Article L. 136-2, II of the French Social Security Code. In respect of a collective redundancy procedure, for which the first meeting with employee representatives is after 1 January 2016. A decree that has not yet been published will specify the rules that apply to employers who pay their employees who use their bicycles to commute a “bicycle commuting allowance” to cover all or some of their commuting expenses. This new measure, which is expected to come into effect on 1 January 2016, will be optional for employers. The AGS “payroll insurance” contribution rate has yet to be indicated. The AGS’s Board of Directors is to meet on 6 January and will decide whether or not to amend the contribution rate. The employer’s contribution toward meal vouchers is exempt from corporate income tax and from social security contributions up to a certain limit. This limit is increased annually in the same proportion as the upper limit of the first income tax bracket. The exemption on meal vouchers will be capped at €5.37 in 2016. Pursuant to the 2016 Budget Act, the annual thresholds at which wage tax must be paid were increased by 0.10% for 2016. The abatement allowed for NGOs was increased from €20,262 to €20,283. Under the decree of 30 December 2015, the following schedule for wage garnishment and assignment will be applicable as of 1 January 2016. 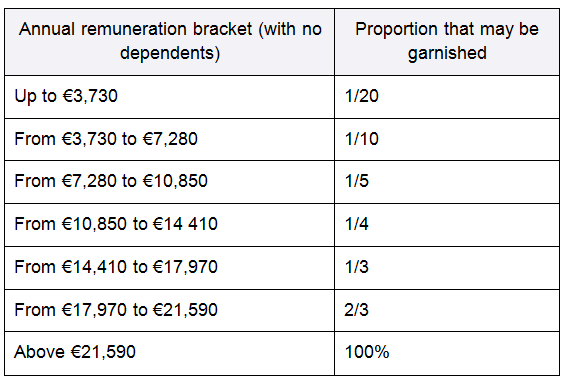 For each dependent of an employee whose salary is garnished or assigned, these thresholds are increased by €1420 in 2016 (€1,410 in 2015), provided that the necessary supporting documents are provided. Although all companies were normally required to comply with DSN form filing obligations as of 1 January 2016, the 2016 Social Security Financing Act staggers compliance deadlines over the year and gives some companies until 30 June 2017 to comply. These companies will be indicated in a future decree. The obligation to achieve DSN compliance by 1 January 2016 now applies only to companies which have been so obligated since May 2015 and to those which have opted for early compliance. The supplementary employee health-care contribution for employees who are covered by the local Alsace-Moselle health insurance scheme will continue to be 1.50% after 1 January 2016. The total employee’s health care contribution will therefore remain 2.25% (0.75% + 1.50%). The CCVRP has informed the Guide permanent paie (published by Editions Législatives) that the capped employer contribution rate for independent VRP sales reps is to be increased from 6.75% to 6.80%. This increase is expected to be confirmed by a ministerial order. The minimum monthly payment and contribution exemption on internships of at least two months was increased to 15% of the hourly social security ceiling on all new internship contracts as of 1 September 2015. Since the hourly social security ceiling will continue to be €24 in 2016, the minimum monthly payment and the contribution exemption threshold will remain at €546.01 (€24 x 15% x 151.67 h) as of 1 January. Since the abolishment of the contribution exemptions allowed for rural regeneration areas (ZRR), local economic revitalization areas (BER) and defence restructuring areas (ZRD), which was one of the measures of the 2016 Social Security Financing Bill, was opposed by French parliamentarians, these exemptions will be maintained. The 2016 Social Security Financing Act reduces the thresholds for standard contribution exemptions and enhances the special exemptions allowed for research and development, communications and information technology, tourism and other sectors. Article L. 752-3-2 of the French Social Security Code has been amended accordingly. These new measures will apply to all contributions due as of 1 January 2016. As you may remember, on 20 November 2015 France’s Conseil constitutionnel did away with the 45% surtax on top-hat pension payments. No surtax will therefore be paid for 2015 since it would only have been due as of 1 January 2016.